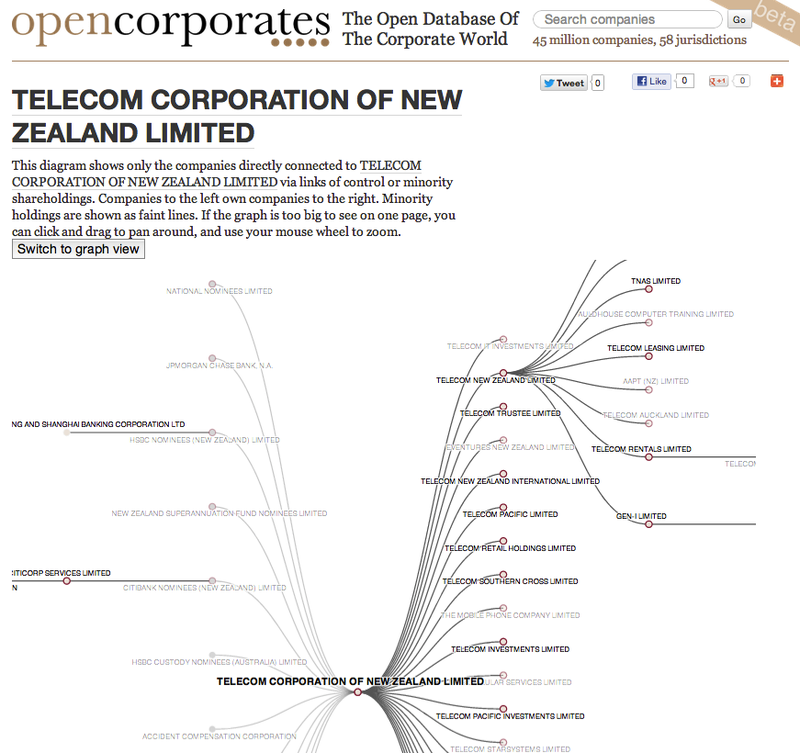 TLDR: OpenCorporates smashes through the 50 million companies mark, and starts work mapping corporate networks. We’re pleased to announce that this weekend we smashed through the 50 million companies mark, with the addition of Thailand, West Virginia and several smaller territories (e.g. Dubai). At last count (it’s changing every hour), we had 50,955,988 companies in 68 jurisdictions. That’s quite an increase on the 3 million in 3 jurisdictions we launched with just two short days ago. We’ve also been adding more and more directors, and now have over 50 million directorships too (helped in part by the UK’s decision to open up its director information), allowing cross-jurisdictional searches of the key people behind companies. There’s a lot more to come in that area too, so stay tuned. Finally, we thought we’d give a sneak peak at what’s coming next: corporate networks (aka corporate hierarchies, although in general parent-child and control relationships don’t form a hierarchy by a complex directed cyclic graph). This is a fearsomely complex and difficult area, both making getting the data and making sense of it, and we’ve been working hard in the background at making sure we do this right. We’re also adding some serious crowdsourcing functionality, to allow information to be liberated from annual reports, unparseable SEC filings, and other sources. 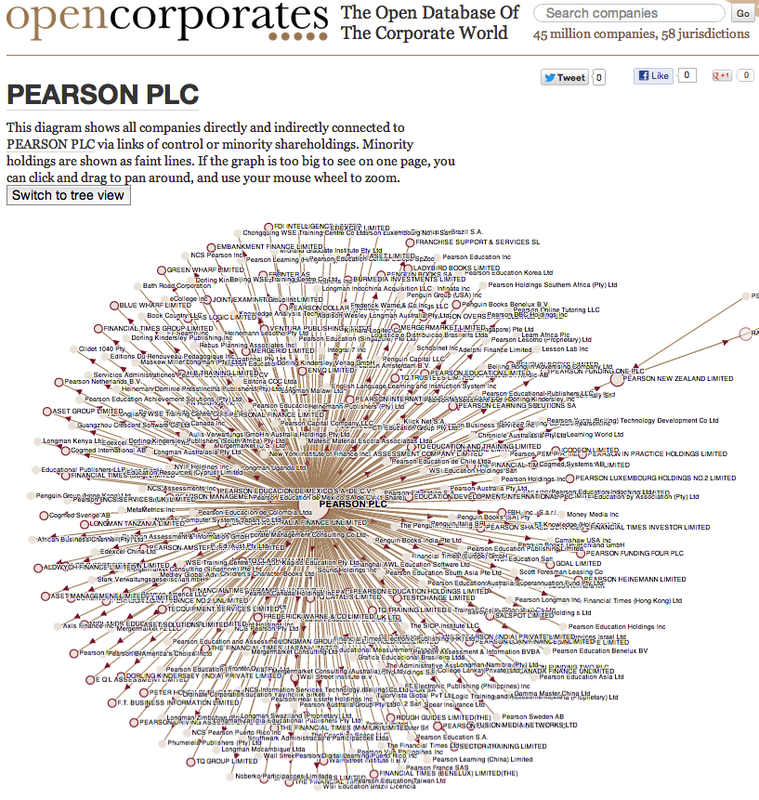 If you’re interesting in being an alpha tester of this (whether you’re an NGO that wants to map corporate relationships of big corporations, companies that want to be transparent about their corporate structures, or just Good People), please email us at info@OpenCorporates.com. Finally, we should mention that this corporate network work is made possible thanks to a generous grant from the Alfred P Sloan Foundation, one of the most prestigious non-profits in the US, and an early backer of Wikipedia and enabler of great projects such as the Sloan Digital Sky Survey. I’m a journalist with a research OCD, and raiding whatever I could see in OpenCorporates between story commissioning and deadline has helped me immensely in making sense (substantial, if not complete) of the mammoth so-called ‘chit fund’ small depositor scam that’s bankrupted millions in East and Central India over the past nine weeks. Many of these ‘NBFCs’ are Ponzi schemes: They don’t quite fit the legal definitions of Non-Banking Financial Corporations, or Collective Investment Schemes, or Residuary Non-Banking Companies, or Miscellaneous Non-Banking Companies (Chit Funds), but nonetheless wheedled and bribed their way into shoehorning themselves into the bureaucratic definitions of one or some of the above. I found a surprising number of these virtually nonregulated companies in the OpenCorporates database – even those absent from the list of the Reserve Bank of India and the Central ministry of corporate affairs, because not all NBFCs are required to obtain Certificates of Registration. The problem is that each Ponzi scheme in a seething nest of Ponzi schemes is still a standalone entity. So, I arrived at OpenCorporates following not the money (there are few paper or transactional trails, and those that are allow themselves to be unearthed are red herrings, for the most part) but the people. It’s taken me a couple of weeks of daytime and graveyard duty to form a complex cat’s cradle linkage between each scam mothership and its very slippery progeny. (India is so vast and unregulated that these progeny, so to speak, are often scattered and hiding under the topographical cloak. The point of my ramble – my sincere apologies for keeping you – is to ask if there is any algorithm that the OpenCorporates team is working with, or on, that will (eventually) permit the construction of a data forest with mutual recursion (not just an tree acyclic graph, leave alone an arborescence, because when I follow the people and not the money or the contracts or the holdings – or any binding transactions – the structure eventually takes the shape of a galaxy of non-ecliptic, non-barycentricity far more complex than the relatively simple cottonseed graph above that describes how Pearson PLC transacts). Instead of spending two weeks – or quite likely more – given the galloping transactional and human mobility, would it be possible in the not (too) far future to be able to construct a pattern using OpenCorporates’s dataset based on both motility and seemingly unplanned intercorporate movement? I’ve never in my career tracked a racket by following the money. But following the people behind a hustle is harrowing work – or was, until OpenCorporates (thankfully) relieved me of the need to make, and retain in my head, connections not obvious to most observers (I have Asperger’s, which is probably why I see all human relations – formal and informal, familiar and alien – and all mechanistic transactions as patterns).